It honestly may have more to do my memories of the restaurant than the food itself. Nearly 20 years ago, I visited the Chef Mickey’s for the first time as a teenager. Chip ‘n Dale were still greeting guests at that time, and Dale got down on one knee and proposed to me. I will never forget how much I laughed with my family. When we prepared to take my son to Disney World for the first time in 2012, I knew I wanted to bring him to Chef Mickey’s. My little Mickey Mouse Clubhouse fanatic would have the chance to meet The Fab 5 – Mickey, Minnie, Goofy, Donald and Pluto – all in one place, without waiting in long lines at the parks. I know that since he was only two years old, he probably won’t remember that trip or that experience. But I will never forget his face when he got up to hug Mickey and the rest of the crew. Chef Mickey’s will always be a priority in my dining plans, because the food is good, the characters are fun and the experience is… magical. 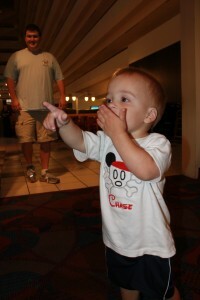 We have been to Chef Mickey’s several times in the past few years, each time enjoying the breakfast buffet. In all honesty, Tusker House has my favorite buffet style food. However, Chef Mickey’s has a few other things going for it. First, it is located in the Contemporary Resort. It is incredibly easy to dine at the restaurant and then head in to the Magic Kingdom on the monorail. And, I like the character interactions better. There are more friends to meet, and when the music starts playing and everyone begins whipping their napkins in the air and dancing… well, it is just a lot of fun. Like most of the buffets at Disney World, Chef Mickey’s is pricey. Depending on what time of day you go, the experience will run you anywhere from $30-$60 per adult. The restaurant is open for both breakfast and dinner. The food is good. It’s not the most creative meal you’ll have at Disney World, or the best, but you should find something to please everyone in the family on the buffet. Breakfast offerings include Mickey waffles, various Kellogg’s cereals, a variety of fruit and yogurt, cheesy potatoes, bagels, bacon, sausage, French toast, quiche, eggs and oatmeal. Dinner offerings include chicken, pasta, mixed vegetables, macaroni and cheese, salmon, mashed potatoes, pizza, and an ice cream bar. It is fairly loud in the restaurant, so it is important to take that into consideration before making your plans. Have you been to Chef Mickey’s? What are your favorite memories? Kelli is a stay-at-home mother with two wonderful children. She enjoys reading, crafts, and planning her family’s Walt Disney World vacations!